I recently had the opportunity to wander Newton County on a beautiful, sunny day and was amazed at the interesting things that I came across. Having lived in Jasper County for the past 25 years, I had made many forays into Newton County to visit the Punkin’ Vine Fair, attend weddings and visit friends, but had never really stopped in the towns to see what they had to offer. My road trip started in Roselawn, which is located in the northeast corner of Newton County. I deviated from my normal route of taking St. Rd. 10 straight across to US 41 and instead chose to go through the town of Lake Village, where I drove down flag-lined streets on my way to the highway. Small businesses dotted the road alongside neatly kept houses with pretty flower gardens. 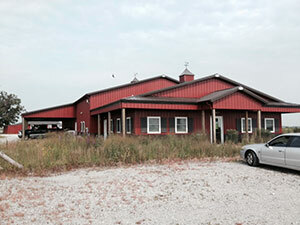 Just a short drive from Lake Village is the Efroymson Restoration at Kankakee Sands. I’ve been intrigued by this effort to restore part of the Grand Kankakee Marsh to its former glory, so I was excited to have the chance to stop and see it for myself. Just off the highway is the main office, a low red and brown building. I parked there and walked over to the information center, where I discovered many interesting facts about Kankakee Sands, such as 99.9% of the original prairie and savannah that once dominated the region has been destroyed. I enjoyed the peacefulness of the setting and was tempted to wander through the prairie on the Wet Prairie Trail. Because of time constraints, I settled for watching a lizard skitter across the gravel on my way back to the car and stopping to observe the wildflowers near the building before heading on my way. My next stop was just a few miles south on US 41 – Morocco. The downtown area has a few cute shops and lots of potential; the town’s parks were impressive. 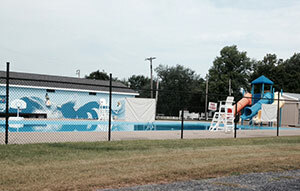 Westfield Community Pool and Sam Rice Park feature a well-kept pool, baseball diamonds with lights and a basketball court. Nearer to downtown, Recher Park looked very inviting with its tidy playground areas, picnic shelters and huge trees. My favorite stop in Morocco by far was at the law offices of Blaney and Walton. I’m sure you’re wondering why a lawyer’s office would be so interesting to me. 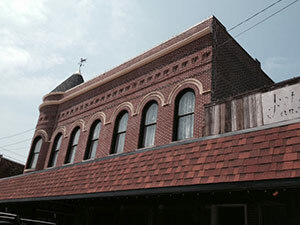 Well, not only is the interior of the building beautifully restored with its brick walls, high tin ceilings and wooden floors, the back portion of the building houses the Antique Snowmobile Museum of Indiana. 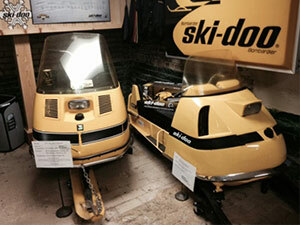 Recently voted one of the top five snowmobile museums by American Snowmobiler Magazine, this neat, two-floor museum has some awesome displays, including antique snowmobiles, gear, signs and promotional items. Dan Blaney graciously took some time out of his schedule to give me a tour and explain the history of the museum. 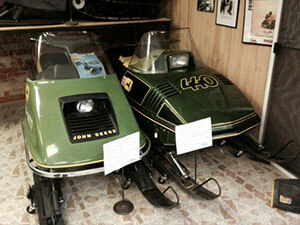 My favorite snowmobiles were the John Deere ones, with their retro feel and cool green paint jobs. I thoroughly enjoyed my stop at this unique museum. It was fun to learn more about the history of a sport that I’ve participated in over the years and to get a chance to visit with Dan. The next stop on my Newton County journey was Brook. I have a good friend from Brook and I’ve always heard about how much she loves her hometown. Her wedding dinner was catered by Earl’s Dining and Catering in Brook, and it was fabulous. This popular restaurant is known for their one-pound pork chops – something I hope to have the opportunity to try in the near future, since they were closed when I drove by. I wandered around town and found McKinley Park and Brunton Athletic Field. 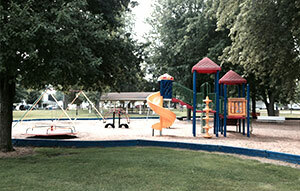 Both parks had great facilities – playgrounds, baseball fields and more. 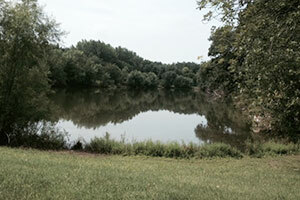 A short drive south of town took me to Lake Kenoyer, a neat little lake that’s a favorite with local fishermen. A young couple told me that they had just discovered for a small fee, annual permits could be purchased which allowed year-round access to the lake. They also told me about the cabin and picnic shelter which could be rented out for parties and reunions. I left them to their fishing and headed out of town. On my way to Kentland, I passed a cemetery that I have driven by many times thinking that it would be interesting to wander through someday. Well, being that it was road trip day, I turned around and headed back to that cemetery. 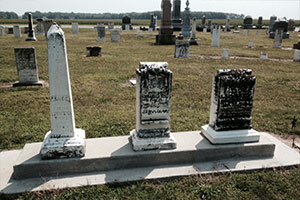 I love walking through cemeteries to see how old the gravestones are. I was not disappointed with this one – the earliest grave that I found was from 1810. I found it fascinating to read the headstones and wonder about the people that were buried there many decades ago. Leaving the cemetery behind, I made the short jaunt to Kentland. I’ve been to Kentland on numerous occasions, so I decided to find something I wasn’t familiar with, in addition to checking out the Old Colonial Inn, which has been recently refurbished and turned into a restaurant. I parked across from the Newton County Courthouse and strolled the downtown sidewalks. 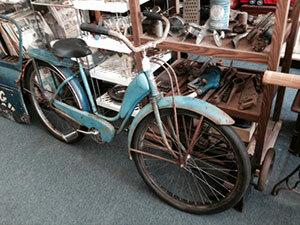 A small store with no sign, but many antiques in the window, caught my eye. Antiquing is one of my favorite hobbies – I’m always on the lookout for McCoy pottery. Tom, the owner of M&M Enterprises, introduced himself to me and showed me around his shop, including the back room where he does an amazing job upholstering furniture, golf cart seats and other items. 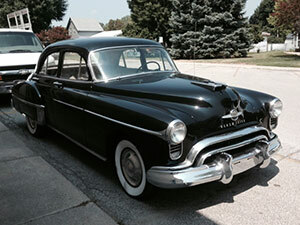 He even showed me the antique car that a client just brought to him to have the interior refurbished. Tom was great fun to talk to, especially since we found out that we had a mutual friend – Dan Blaney. I bid Tom goodbye and headed toward the Old Colonial Inn, which is housed in a beautiful brick building with a round turret on the corner and antique lace curtains in the windows. The building was built around 1894 and was originally the Hotel Kentland; a restaurant opened in the same building decades later in 1964. Much to my dismay, I learned from a sign on the front door that the Inn is only open Thursdays through Saturdays. I did peek in the windows and was impressed by the interior – it has been refurbished to suit its original time period quite nicely. I’ll have to make a point of getting back to Kentland to dine at this historic restaurant. 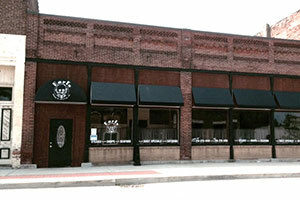 If the food is half as good as the ambience of the building, it’s sure to be a pleasurable meal. As much as I would have enjoyed wandering the covered sidewalks of downtown Kentland and exploring the cute shops, I knew it was time to get back to work. Reluctantly, I got back into my car and headed toward I-65, passing through Goodland on my way. I wrote myself a mental note as I passed through the town to put next summer’s Goodland Grand Prix Festival on my calendar. It’s another one of those Newton County adventures I’ve yet to experience. 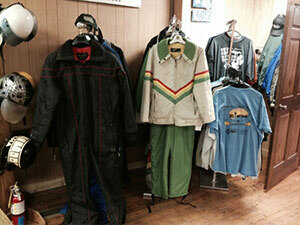 I crossed a few off my list on today’s road trip – can’t wait to experience a few more!